Ask fellow campers about "Petenwell County Park" and nearby attractions. We stayed in Site 1 which was right on the lake. Was a bit breezy at times but no bugs. Other sites away from the water are surrounded by trees. So you have your pick of type of site. Loved this place. We camped at Petenwell County Park in a Fifth Wheel. Have many seasonal and monthly rental sites. Reservable nightly sites are limited. They have some large group sites. Petenwell is a County Park, but over half the sites were taken by seasonal campers. Some of the campers had obviously been there a while, making the campground look rundown. 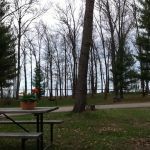 The campground is divided into two sections. The older section is where you find most of the seasonal sites. Of the available sites remaining, a few are reservable. There are very few sites available on the lake shore of Lake Petenwell (a huge lake by the way). Most of those are already taken. So realistically, if you are going to camp here, you will end up in the treed part of the campground. The shade there is nice, the bugs aren't (including mosquitoes). There is a newer expansion area that we would have stay in if we had known about it. It was definitely not as full, a lot less seasonal sites, and easy access to the shore of the lake. Some sites have water and 50 amp electric, some don't, so ask. The main roads are paved, the rest are dirt. The sites can be grass if you are not under the trees, dirt if you are. The campground can accept big rigs, but you have to be careful about what site you choose. We ended up giving up our reserved site because we couldn't fit. We ended up across the street that we could fit into. The staff was very accommodating about us moving, friendly too! Bathrooms are ok, nothing to cheer about. Showers require quarters to operate. The beach was very nice, the marina excellent. The playground in the expansion area was new. You can get Verizon 4G in the park, but it varied upon where you were. I ended up using my cell phone booster part of the time. A family member had an smart phone from one of the smaller local carriers and could only get a signal if she stood in the middle of the park. There were 6 OTA television stations. All in all, if you go here, I would to the newer expansion area over the older area. But I doubt if we will ever go back to this campground. We camped at Petenwell County Park in a Motorhome. Very nice park. No four wheelers racing through the park. Very nice family and fishing park. Clean, seems to be well managed. Normally do not stay in a county park, but this is a diamond in the ruff for sure. Will come back or sure. We camped at Petenwell County Park in a Fifth Wheel. A very large park,431 acres. Has recent expansion of campsites and a new marina. We stayed in the new addition with a beach area to swim and park the boat. The park people are very helpful and friendly. The lake this park is on is the second largest in the state, fishing was good. They have a marked beach area, but where we were at,we had our own sandy beach that was shallow for quite a long distance. Great time for everyone, will be going back as this is one of our most favorite parks that we have been to. We camped at Petenwell County Park in a Motorhome. Are you affiliated with Petenwell County Park ?